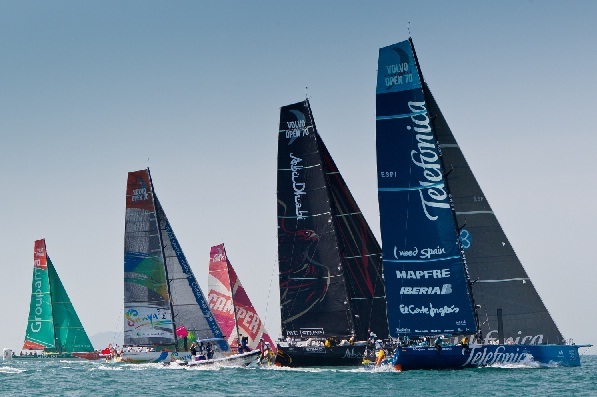 Team Telefónica will lead the fleet out from Sanya in China and on towards Auckland, New Zealand at 0700 local time on Monday (2300 GMT, Sunday) after Iker Martínez´s team took advantage of an astonishing collapse by PUMA to win Leg 4 Stage 1. The Stage 2 start will be staggered according to finishing times on Sunday, meaning Telefónica will begin with an advantage of 02 minutes 34 seconds — their margin of victory over Groupama sailing team in a 43.2 nautical miles sprint that PUMA had looked set to win easily. Ken Read’s team built a huge lead only to sail into a wind hole, leaving them forced to watch the entire fleet sail right past them. They eventually finished over 39 minutes behind the leaders, leaving the skipper angry and upset. "I’ve never seen anything go so bad that started so good," said Read. "We got literally a two-mile lead after sailing fantastically, park in a hole and then watch the fleet sail by a couple of hundred yards from us. It’s infuriating. After studying the data again on Sunday, Race Director Jack Lloyd told the teams conditions would allow a Stage 2 start at 0700 local time for the first boat. The six teams will sail 5,220 nautical miles to Auckland, with an early ETA of March 8. Telefónica were running in third before CAMPER experienced trouble with an unfurled sail and then PUMA lost all wind. "We were a little bit fortunate today," said Telefónica watch leader Neal McDonald. "We were going around the triangle inshore in third place and we were quite happy with that. Then all of a sudden CAMPER had a little problem and we were in second, then by the time we got to the statue down the other end we were looking good, then bad then good again and we held on." The biggest upset was on board Ken Read’s PUMA when their huge lead disappeared completely after sailing into a windless area shortly after starting the home run back to Sanya. Read’s men on PUMA’s Mar Mostro could only watch as all five rival teams passed them in better breeze while they floundered with windless sails flapping. "We were literally miles ahead," said Read. "I don’t know what to say. It’s hard enough in this fleet not to give everyone else an hour advantage." Team Sanya were in a positive mood after finishing in the middle of the fleet for the first time since the Iberdrola In-Port Race in Alicante. Ever since that first day of action in the race they have either failed to finish or come in last. "It was pretty full on, exhausting stuff but we’re very happy," said helmsman Richard Mason. "It’s the first time we’ve really passed a boat. When we passed Groupama, we were shouting ‘C’mon old girl, you can do it old girl’. It was great. Fortunately we had some opportunities in a transition area and managed to get passed CAMPER and PUMA so it was wonderful to finish in fourth, and let’s hope we can stay in fourth."